Hello and welcome to my first hop here with the Stamper’s Dozen Blog Hoppers! I am so excited and honored to be a part of this group! This month we are featuring our favorite sets from the NEW 2017 HOLIDAY CATALOG. I have chosen the Snowflake Sentiments Bundle (146052/146053) featuring the Snowflakes Sentiments Stamp Set (144817/14420) and the Swirly Snowflakes Thinlits Dies (144678). When you get your catalog, you can find the set on page 35! This first card is simple yet elegant! 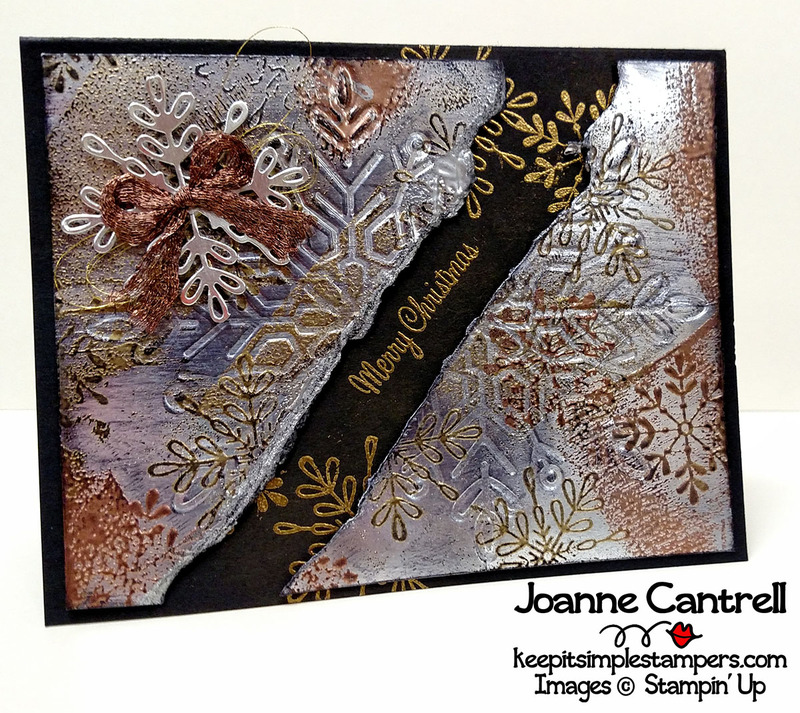 For this card, I used Silver Foil to cut the band of snowflakes using the Thinlit. 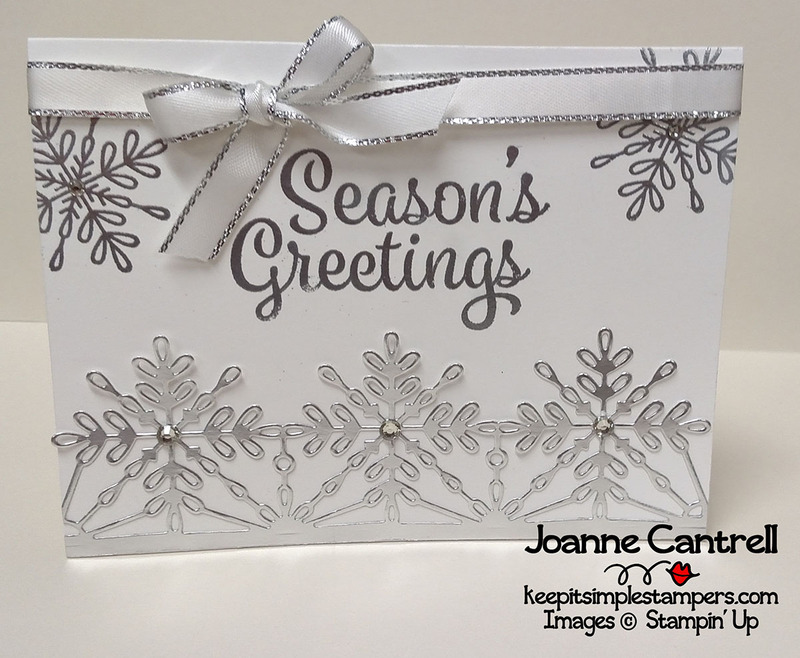 I used silver embossing for the sentiment and other snowflakes. A little silver edged ribbon and some rhinestones is all it too to add that touch of sophistication to this very easy card! The next card has a completely different feel! It was inspired by Robin Messenheimer. Who says that you have to use red and green on a Christmas card? This one uses two of the new In Colors… Berry Burst and Lemon Lime Twist. They play really well together on this modern, non-traditional card. And, BONUS… I made a project sheet for this one! 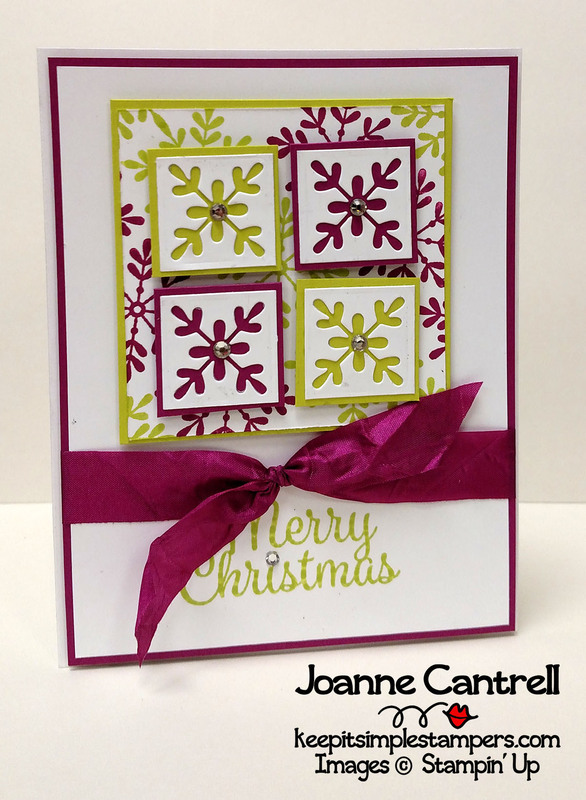 Until next month… keep it simple, Stampers! Hi Joanne. I love, love, love your Impressions of Tarnished Foil snowflake project. It is in fact, my favorite of any of the Tarnished Foil projects I’ve seen anyone else create and have added it to my dedicated Pinterest board to this technique. As the originator of this technique I have made and seen many projects and this one is simply awesome! Thanks for sharing!